Peter Bryer: Mobile Foresight: The history trajectory: Windows Phone v Android. It's a slippery slope. The history trajectory: Windows Phone v Android. It's a slippery slope. Some real sketchy market share figures have been coming in for Windows Phone. When a platform vendor never talks current numbers but rather makes vague market statements about future potential and positive reviews, it's fair to take low-ball estimates as good enough. 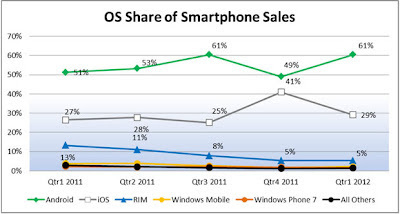 I've seen some market share estimates for Windows Phone 7, most are in a similar range of around 2.5% of global handset sales and NPD, which measures sell-out share, estimates Windows Phone's Q1 2012 U.S. share at 2%. Compare this to Android's 61% for Q1. Some analysts have stated that Windows Phone is off to a similar start as Android. This all depends on how one likes to round numbers. Android's sales started in Oct 2008 with the T-Mobile G1, which was the only mainstream Android-based smartphone on the market for many months. But that single device alone drove Android sales to more then 2%. And as soon as the Android floodgates were opened during the second half of 2009, Android was able to approach double digits in short order. After one year and one quarter on the market, Android pushed 11% of global handset sales. And after a bit more than four quarters, Windows Phone is at something approaching 3%, if you like to round up. Three percent is approximately where Android was after three quarters. So what's a quarter and a month and a few basis points between friends? In reality such side-by-side, quarter-for-quarter comparisons aren't particularly could be extremely misleading without taking into account all the parameters. The truth is, Android (as well as iOS), have simply been amazing market performers, either catching the smartphone wave with perfect timing, or making the wave. The interesting parameters for Windows Phone are floating in front of us now with Nokia's Lumia models getting some real airplay. The next two quarters should add up to tell us a more accurate story.